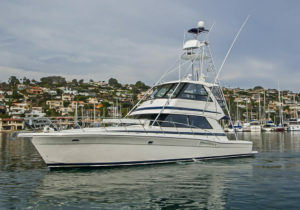 This 48′ Riviera Convertible for sale by Kusler Yachts San Diego yacht brokers is an amazing offer. 25K Reduction – Caterpiller C-12 re-power, Fresh paint and new interior. LLC Owned. The Riviera 48 racked up some impressive sales figures during her production years, the result of her striking good looks, spacious interior, and a very competitive price. Like all Rivieras, the 48 is heavily built on a solid fiberglass hull with a wide beam and a shallow keel. “FORTUNA” is a proven tournament winner and has been professionally maintained since new.”FORTUNA” underwent a full interior refit that was completed in January 2018, including all new soft goods, electronics, and a 3-step detail. Don’t miss this opportunity to check out a truly turn key Vessel. Contact California sportfishing experts Kusler Yachts for more information at (866) 607-5471 or pete@kusleryachts.com for more information.